A name commonly found among the Jews. The first person known to have borne it lived in the middle of the second century (Pes. 113b). His real name, however, was Judah; and "Aryeh," or to give the more exact and fuller form, "Gur Aryeh" (Lion's Whelp), was a complimentary addition to it (borrowed from Gen. xlix. 9). 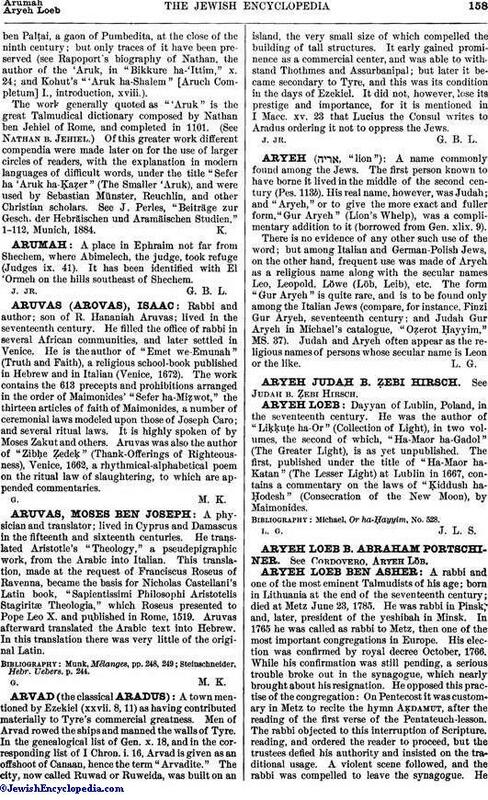 There is no evidence of any other such use of the word; but among Italian and German-Polish Jews, on the other hand, frequent use was made of Aryeh as a religious name along with the secular names Leo, Leopold, Löwe (Löb, Leib), etc. The form "Gur Aryeh" is quite rare, and is to be found only among the Italian Jews (compare, for instance, Finzi Gur Aryeh, seventeenth century; and Judah Gur Aryeh in Michael's catalogue, "Oẓerot Ḥayyim," MS. 37). Judah and Aryeh often appear as the religious names of persons whose secular name is Leon or the like.